Monday/Wednesday/Friday, Monday-Friday or Tuesday/Thursday for preschool, modified daycare or fulltime. The oldest group of children, the Pre-Kindergarten (Group 3) class, must attend preschool Monday-Friday. Please contact us to schedule an appointment to learn more about our school’s program. Children in the Temple Beth Israel morning preschool program are divided into age groups, based on their age as of September 1 of the school year when they enter. Children need to be 2 years old prior to enrollment and 2 year olds in our Group 1 Program do not have to be using the toilet independently before enrollment. Children who are enrolled in the full day program are in a mixed-age group in the afternoons. We aim to keep a 2:15 staff-to-student ratio with our two groups of older children and 2:10 ratio with our youngest group of children. In all of TBI's children’s groups, there is a balance. The balance is between outdoor and indoor activities, a balance between teacher-guided and child-initiated play, a balance of Jewish and secular learning and a balance of opportunities for independent play and social interaction. Exploring, discovery and learning are promoted within all of our age groups. Children move from one class to the next at the beginning of the school year, and the focus of each group reflects the children’s developmental stages and increasing skill levels. Our teachers understand the importance of interacting with each child in a meaningful way to support and extend their learning. Group 1 children are entering our program at age 2, thus attachment is a crucial focus for both child and parent. Our preschool teachers are caring and nurturing as they help a child become accustomed to a school routine. The area of communication and language are also major areas of growth with our two year olds. The trust that children develop with our staff encourages their developing language and social skills. Exploring and discovery are what our Group 1 children do. Our Group 3 class is also known as PreK, for this class prepares our children for kindergarden. The 4-5 year olds become involved in a variety of activities both of their own interests and planned by teachers. These children feel ownership of their daily routines, taking more and more responsibility for their actions. Mitzvah notes, Child of the Week, introducing phonics, journal drawing & dictating, are just a few of the activities that the PreK class is engaged in. Our goal is to introduce and expose children to a wide range of activities and ideas, which encourages their interests and learning. 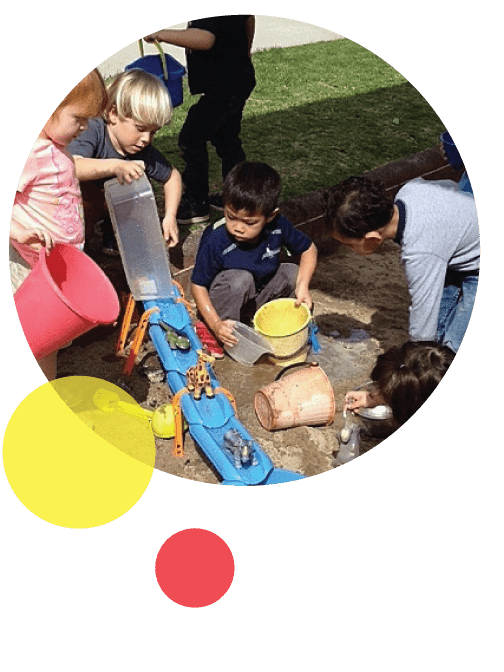 At TBI Preschool, children benefit from a wonderful balance of child-centered and teacher-directed activities, separate morning age groups and an afternoon mixed age group, with the integration of secular and Jewish curriculum. Temple Beth Israel is a Jewish preschool open to the community. National and Jewish holidays are observed. The integration of Judaism into our early childhood program makes Shabbat a highlight of our school week and creates the understanding of mitzvot, among other early Jewish experiences. For those families who aren’t Jewish, it’s an opportunity to learn about Judaism and share in traditions with friends.